A close up, please excuse the headless chicken shots, both my hair and face were not cooperative at the time. 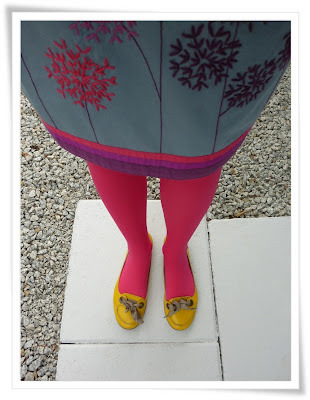 Im linking up with Visible Monday at Not Dead Yet Style and the Colour blocking challenge at EveryBodyEveryWear (EBEW). Love your colour blocklin, my new blogger friend. I like you with head better, lol. So pretty, Izzy! I love the Fly London shoes too (wonderful brand, imho) and the pink tights. Thanks for linking up with Visible Monday! Those shoes are adorable! I'm not surprised they're from the awesome Fly London (love their shoes). Love the print on the skirt and the contrasting colors of the cardi and top. LOL wouldn't that be nice to run to the store on a bad hair/makeup day and just leave the head home? Fabulous! I love all the colours and the POP of yellow at the bottom. This is wonderful. I love the layers of this outfit and the colors! Very fun. Your colours are wonderful! I love them! The yellow top caps are perfect. I love the layering with the cardigan and the unexpected pop of yellow shoes! Wonderful! Ahh I love this Boden skirt - have been lusting after it int he catalogue!